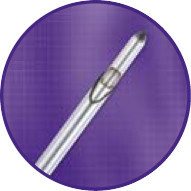 DUAL OPPOSED OBTURATOR ‘EYES’ reduces risk of blockage from tissue and ensures rapid fill so reducing operating time. 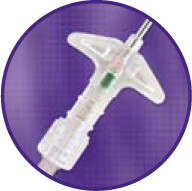 INJECTION MOULDED HUB assembly ensures strength and needle security with no risk of needle detachment. COMFORTABLE, EASY GRIP HAND PIECE gives precise control on insertion. INSUFFLATION FILTER SETS with 0.1 micron filtration and hydrophobic barrier complete the range.